West Bengal Chief Minister Mamata Banerjee has started a dharna to ‘save the Constitution’ after a forty-strong CBI team tried to enter the residence of Kolkata police commissioner Rajeev Kumar to interrogate him in the Saradha ponzi scam. Banerjee rushed to the ground opposite Metro Cinema near the historic Shaheed Minar where she has sat on dharna on several occasions as Opposition leader. Earlier, she rushed to Kumar’s residence after Kolkata policemen stopped the CBI team from entering their chief’s residence and another of their team encircled the residence of CBI joint director Pankaj Srivastava and threatened to arrest him if any harm came to Rajeev Kumar. 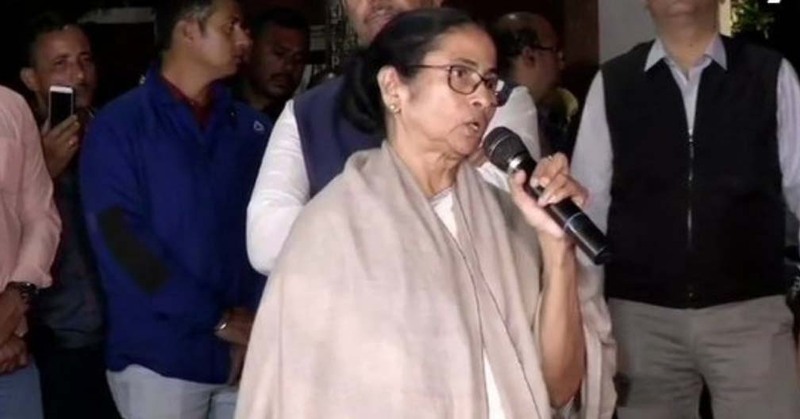 “Narendra Modi and Amit Shah have stooped to unprecedented level to unleash a reign of terror against Bengal since I organised the united India rally of opposition parties this month,” said Mamata Banerjee. She alleged the CBI team came without any search warrant but CBI sources alleged Kumar had evaded questioning in the Saradha scam and could be destroying evidence as he had headed the special investigation team in the Saradha case. Mamata alleged that BJP’s Assam minister Himanta Biswa Sarma had been involved in the Saradha scam. “He (Himanta) was investigated in the case before he joined the BJP but now he has gone scot-free,” said Mamata Banerjee, adding that the Modi-Shah combine had politicised the Saradha case just before the 2019 polls. Appealing to Bengali pride, Mamata said the people of her state would teach the BJP a lesson. “Their destruction would begin from Bengal. We are not afraid of Modi, his fall has begun,” warned Mamata. But the CBI stuck to its guns, saying they will move the Supreme Court and the Governor, if necessary, to deploy the central forces to be able to interrogate Rajeev Kumar. “We are well within our powers to interrogate Rajeev Kumar. The Kolkata policemen who obstructed our investigating officers can be punished,” said a CBI legal counsel. CRPF units have taken charge of protection of the CBI office at Salt Lake in Kolkata. But CBI officers, who went to interrogate the Kolkata police commissioner, have been detained in the Shakespeare Sarani Police Station. “Their action was illegal, so we detained them,” said a joint commissioner of Kolkata police. Later at night, the CBI officers were let off.